They seem mutually exclusive: organic beauty and sleek, modern packaging. I try to use environment-minded products, but their paper and card board containers they typically make a crumbling mess of my luggage, handbags and vanity. So packaging wins, unfortunately. I see something silver, sculptural, graphic, shiny, dazzling. My eyes sparkle. Danish-born New York makeup artist Kirsten Kjaer Weis marries contemporary engineering and design with natural ingredients in her eponymous cosmetics line, Kjaer Weis. "The visual and aesthetic parts of daily life are important to me," Kirsten has said. These weighty silver cases are made out of zamac, an alloy of magnesium, zinc, copper and aluminum. While priced on the high side, seeing the pieces on counter feels like a private MOMA installation inviting me to create smoky eyes. And the formulas are equally elegant. All products are certified 95 percent organic by the Italian organic organization CCPB, with pigments and raw materials extracted from wild flowers, minerals and plants. The line also does not contain at petrochemicals, silicones, parabens, synthetics colors or fragrances. 1. Kjaer Weis Lip Tint in Sweetness, $48 at kjaerweis.com. 2. Kjaer Weis Lip Tint in Romance, $48 at kjaerweis.com. 3. Kjaer Weis Eye Shadow in Wisdom, $44 at kjaerweis.com. 4. 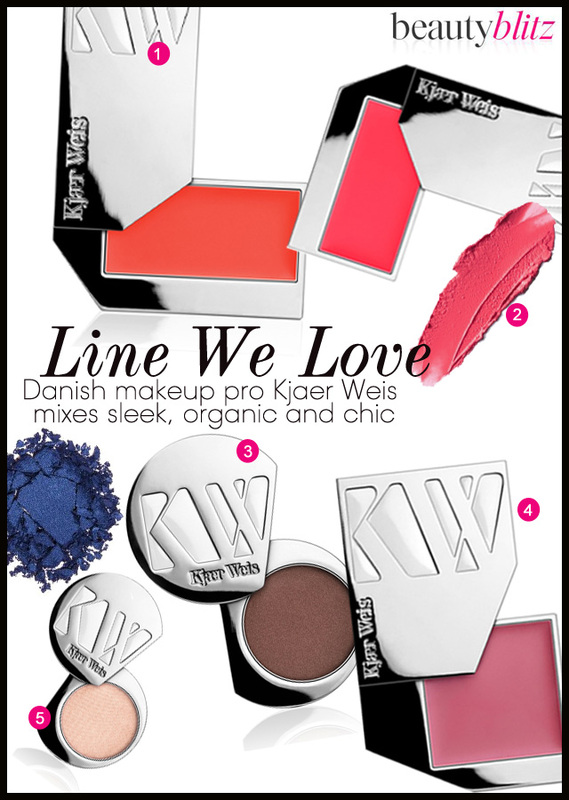 Kjaer Weis Cream Blush in Lovely, $54 at kjaerweis.com. 5. Kjaer Weis Eye Shadow in Cloud Nine, $44 at kjaerweis.com.